…even where one would never expect it. With 15 years experience, STAT-UP provides you with solutions to problems in nearly all industries. From individual subservices to complete solutions, our offer is custom-made to your needs. Discover a selection of our customers and projects in your industry or your division. Predictive maintenance, experimental design/DoE, quality engineering, statistical process control/SPC, durability analysis, transport and storekeeping optimization, etc. In the automobile industry, chemical industry, medical technology or with manufacturers of industrial products, statistics typically is used for quality assurance, but also within research and development. Especially in industrial statistics expert knowledge is needed, whether hundred thousands of data records are to be evaluated meaningfully or due to time and budget constraints only very few experiments be conducted. As a client from the manufacturing industry, you would like to optimize your supplier and guarantee risks with regard to cost benefit criteria. In the research and development you need information rich data, i.e. experiments are to be planned in such a way that you experience at as small an expenditure as possible while gaining as much as possible over effect connections and process parameters. Here you profit from our expert know-how in statistics, in particular statistical process control and engineering, as well as from our experiences in handling both with very large and with very small data sets. Owing to outstanding knowledge in SAS, SPSS, R, Matlab, and Simulink we can integrate our work smoothly into existing systems. In an extensive data lab of a DAX group company, we analyze continuously the operational lifetime of components with Advanced Analytics procedures on the basis of big data. Subsequently, we develop and program models for predictive maintenance. We develop interactive web surfaces for risk estimates and evaluation for the user. For the risk assessment of advanced driver assistance systems (ADAS) we provided extensive, ongoing test plans for the different development stages of the software. We handled the whole range of big data problems (numerous interacting variables, analysis of video data), which we solved with layering procedures and generalized regression estimators. An industrial trust assigned us with the execution of data labs, in order to optimize data-supported processes over the entire value-added chain and to develop new databased business models. In a subproject we analyzed error data from the field in combination with production data, in order to optimize tolerance limits and to develop early indicators for later system crashes. For a chemical concern, we worked on a project to lower stock program costs and for the improvement of the supply service, in order to have products with high probability in demand available. We developed forecasting tools in R as an alternative to commercial solutions (SAP APO DP, John Galt ForecastX Wizard), accessing more than 30 different model classes and offering the optimal prognosis in each case . Thus monthly forecasts for several hundred articles/product groups per business unit for each unit can be provided fully automatically . Random inspection plans were developed, in order to determine possible quality improvements through a changed production process with the supplier. The standard tables of the random inspection system according to DIN ISO 2859 (assumption sampling inspection based on the number of incorrect units) were extended by stricter quality levels (AQL, acceptable quality limitation levels). With vdi, VDE, Institute for Forming and Foundry Engineering TU Munich, and more than ten industrial enterprises, we held workshops on quality engineering with Taguchi procedures. Topics were quality measurement, six sigma, analysis of variance, signal-to-noise ratio, and robust design. Were used, among others, Minitab, SPSS and Excel. We train and advise regularly on data management, reporting, experimental design, mixed models, and on general programming questions with the use of R (user environments, Plug -Ins, integration of C-code, development of own packages, object-oriented programming in S3/S4). Model choice for categorial and ordinal response variables (Logit models, log-linear models, quasi likelihood estimation for correlated binary response). Clinical research, statistical programming e.g. gene expression analysis, clinical data management, etc. Which sample size is needed in order to discover a therapy effect with high probability? How can results, e.g. Kaplan-Meier estimations, from different studies be compared with one another? How can frequently returning analyses and reportings, e.g. lab data, be performed automatically? Which statistical procedures are appropriate, if the data possess a certain structure, which would lead to distorted results with standard techniques (e.g. longitudinal data with coincidental effects and correlated errors)? 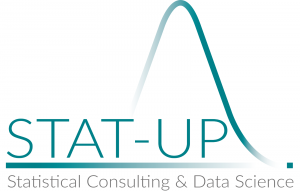 STAT-UP offers expert know-how in statistics, in particular biostatistics, medical biometrics and epidemiology. We combine this with extensive experience in handling large databases. Owing to outstanding knowledge in SAS, SPSS, and R as well as in specialized programs, like e.g. Origin, and XLFit, we can integrate our work smoothly into existing systems. Two publications in collaboration with the Klinikum (clinical center) of the LMU Munich received rewards in 2012 by the American Society of Clinical Oncology (ASCO) and the American Association of Cancer Research (AACR) in Orlando and San Antonio, respectively. Please refer to Data Science in the Manufacturing Industry for our services and references with regard to medical technology. For the research department of a multi-national pharmaceutical company, we programmed gene expression analyses in SAS and R. We also advised on data management with SAS. In particular the connectivity to an existing, central database and the aggregation of data from different clinical studies were of major importance. A different pharmaceutical company tasked us with the evaluation of data from several bio markers in R, as well as the production of English-language analyses reports on the basis of a given SAP. Also part of the order was the validation of existing analysis reports and the production of a English-language validation report with R/LaTeX. For the Federal institut for Risk Evaluation (BfR) we developed a software script for the automatic calculation of microbial growth and inactivating parameters from experimental data. We provided a MySQL database, into which a bespoke python script imported and regularly updated the data of the freely accessible research data base ComBase. The evaluation was done in R, in order to reproduce and extend the analysis methods available from ComBase. The tools were provided completely according to standard S4 and feature an user interface. Also for the BfR we validated and extended R-tools for the analysis of 2-D gel electrophoresis spots. The matching of the data is done alternatively in R or Perl. Functionalities are data filters, different normalization procedures, statistical and graphical analysis methods. The tools include an user interface and are provided in the most current version of S4 standard. As statistical partner, we accompany two long-term projects at two hospitals of the LMU (Dr. von Haunersche Kinderklinik, Frauenklinik an der Maistraße). One project concerns itself with gene environment interactions in connection with the emergence of psychological disturbances in children. The second project is an international study on the research of certain mamma carcinomas. We assumed diverse tasks, for example the sample planning, the statistical analysis of the long term data, and also the preparation of publications. Transcatheter aortic valve replacement vs. natural history of aortic stenosis. Meta analysis of survival data. Risk modelling, portfolio optimization, rating models, quantitative trading models, etc. Quite often efficient programming plays an important part due to large data sets and complex numeric problems. Clients from the financial industry benefit on from our expert know-how in statistics, financial mathematics and actuarial science, in particular econometrics and optimization, as well as from our experience in handling large databases. Owing to outstanding knowledge in Matlab, SAS, SPSS, R and in specialized programs, e.g. Eviews as well as in high-level languages (C++, Java), we can integrate our work smoothly into existing systems. Our evaluation model for Germany’s Annual Hedge Fund Award was presented for the first time in 2008 and has been continuously developed further in the last two years. It received media recognition in Derivate Magazin, the X-Markets Quarterly Review by Deutsche Bank, Wallstreet Online, and the Federal Association for Investment Alternatives (Bundesverband Alternative Investments). The product SENSIS of the German Stock exchange is based in substantial parts on a concept from STAT-UP about the hierarchical simulation of non-linear net yields. The German Stock Exchange used this methodology in the Fuchsbriefe test; project manager Christian Libor accounted in detail in magazine of the asset manager avesco. We developed a multivariate prognosis model (k-Factor-GARCH) for credit risks as basis for the development of innovative structured products. This model forecasts the development of index volatilities and correlations on branch and regional level. In addition, we developed and validated a procedure for the model choice, since classical assumptions of statistic tests were violated (normal distribution, uncorrelatedness). The programming of the model, as well as associated numeric optimization procedures and appertaining graphic library, was done in C++. We validated and optimized quantitative volatility arbitrage and long/short equity strategies, which were used in two funds for institutional investors. Besides, we made risk and performance operating numbers available for the factsheets. We investigated an ALM model with a Bayesian component together with the endowed chair Asset Management (EBS). We accomplished the simulation of the so-called „probabilistic utility” with a hybrid MCMC by replicating an Al-portfolio through a Vector Equation Correction model. It was calibrated by indices of different asset classes. This model obtains more stable weights than the classical Markowitz optimization, offers a better illustration of the risk aversion of an investor to make possible, and last but not least supplies information about the uncertainty in the estimation of the optimal asset allocation. We contributed to the conception, and we executed the entire empirical part of the study, including the implementation in R.
We developed and programmed a parametric volatility model in Orc VM API. Programming language was C, substantial requirements were an economical parameterization as well as a consistent interpolation over strikes and terms in the generation of the surfaces. We develop and hold workshops among other things on risk measurement and – control, classification of insured individuals, scoring procedures, Basel-II-compliant calculation of PD and LGD. Also, the software packages SPSS, Stata, and R were trained. Target Audience Analysis, Reader Surveys, Order Data Processing, etc. If you are uncertain in the course of your journalistic activity over the interpretation of statistics, then we are gladly here to help you. We already compiled some notes on the avoidance of typical error sources for you. Target audience and market analyses, and reader and listener surveys encertain the necessary customer focus of publishing houses. STAT-UP factors in the evaluation already during the first planning steps. We ensure that the looked for information is contained in the collected data. By this we secure the efficiency of the surveys. Frequently the data collected by a survey are to be set in correlation to data from other sources. STAT-UP offers to search for suitable comparative data, check these for plausibility and computes indices or similar characteristic numbers, in order to e.g. check the representativity of the results. Special knowledge in questionnaire design and shipping planning (total design method) enables us to optimize the return. To third parties we act as neutral institution with in-house privacy officer and liase as contacts for further inquiries. We also conduct surveys. Clients from the media sector will profit from our expert know-how in statistics, in particular questionnaire methodology, descriptive, and multivariate statistics, as well as from our extensive experiences in handling large data sets and missing data. Owing to outstanding knowledge in SPSS, R, Excel, and Powerpoint we can integrate our work smoothly into existing systems. In the years 2008 and 2011 STAT-UP conducted reader surveys for the Bayernkurier on behalf of a media consultant. We advised on the question selection, layout of the questionnaire, programmed an online questionnaire, united the data from the written and the online questioning in a database, evaluated the results, and prepared them graphically. We analyzed the answers to the open questions by text mining and formulated an interpreting summary. As additional service, we placed a contact for privacy questions, evaluated the subscription requests and pulled by random selection the winners of the incentivating book lottery. The Bayernkurier published some results on its web page. For the magazine HotelMOSAIK we conducted on behalf of SV onpact GmbH, a similar survey in the year 2009, which, however, was aimed at hotel operators. Apart from data preparation, this project demanded complex research work, since the answers were returned by fax, which massively impeded the correct data gathering. For Munich radio station 2DAY, we provided a statistical appraisal to possible methodical weaknesses of the Funkanalyse (radio reach analysis) and mediated between the client und TNS Infratest. We regularly conduct data adjustments. Supplements of advertising partners are to be dispatched to receivers with as high an product affinity as possible, however not to existing customers. In order to fulfill privacy-legal requirements, we conduct the order data processing, acting as the interface between publishing house, advertising partner and consignment service provider. We also evaluate the refusals for the optizimation of scoring models. Campaign Management, Data Mining, Reporting, Up- and Cross Selling Potentials, etc. The IT and communication industry usually deal with very extensive data sets, on whose basis optimal customer-oriented distribution strategies must be developed (analytical CRM). Customer acquisition, customer retention, and customer value are crucial correcting variables for the success of our clients from the IT and communication industry. Vast amounts of information are hidden In your customer data, which you need, in order to make the correct offer at the right time for the correct customer. We unite our statistical know-how on DATA Mining, Scoring, OLAP, and Business Intelligence with many years experience in DWH, expert knowledge in campaign management, and handling of complex IT systems to the benefit of our customers. Use analyses of CDRs. The consolidation of CDR bulk data is a condition for different analyses, simulations, and retention programs. Balanced Score Card. Telco specific Balanced Score Card systems for management support. Sales Channel reporting. Based on salesoriented Datamarts planning, budgeting and controlling of sales relevant characteristic numbers and key performance indicators are facilitated. Fraud Detection. Automated identification of fraud patterns in customers and resellers. Tariff simulation. Evaluation of CDRs with freely configurable tariff parameters, in order to simulate the entire yield profit/loss and the attractiveness of a tariff for each customer (churn reason). For a contract filling company and retailer of almost all mobile phone providers represented on the market, we developed a training on customer segmentation, cross selling management, direct marketing campaign management, response evaluation, and an emphasis on churn analysis (fraud prevention, customer valuation, life cycle analysis). We repeatedly advised one of the largest world-wide software vendors from the development of algorithms to efficient programming with various Big DATA topics. Focus was on the selection and implementation of classification procedures (k-Means, random forests, association analysis, generalisation of linear models), on the development of prognosis models, and on database access techniques with Revolution R.
How did the ARPU develop in the last 6 months for the customers, who within the first 2 months after the launch of product B, of product A to B is changed (Early Adopters)? Which influence did this change have on the profitability of these customers? How many customers have more than one contract and when did the customer relationship begin? What is the drift rate of customers with an product upgrading in comparison to the average? How is the customer life value (CLV) determined? Through which distribution channel are contract extentions most successful? Sports & Leisure, E-commerce, and Internet-based Services, etc. On this page you find unexpected examples of our activities. We consider these projects the best proof for the fact that we as statisticians are true trouble shooters and communication experts, who on a daily basis successfully mediate between the world of our customers and the world of numbers. Statistics are gaining increasing importance in the legal environment. DNA analyses, for example, are based on statistics, but statistical knowledge is hardly ever obtained during legal training. The German Federal Supreme Court of Justice argued with statistical terms („Repräsentativität “etc.) in cases of mass fraud. We back attorneys with litigation support, expert reports or case-related coaching. You would like to examine which characteristic values enable you to predict e.g. success in a sports match on the basis of training parameters, or the success of a professional team on the basis of its organisational structure. Or you would like to measure something immeasurable but do not know how to quantify matters. You would like to match – either matchmaking or employer and applicant- and you would like existing data structured to evaluate and increase accuracy. You are interested in connections, reciprocal effects, or simply what made an event a success with customers and employees while another did not go over big. For all these tasks you need you statistics – we back you with expert answers. be2, one of the worlds’ leading matchmaking services, assigned us in 2005 with the development of a new personality test. The test should appeal to as well as entertain the potential members, while at the same time being scientifically well-founded and to a large extent compatible to the previously used test, and enable an automated matching of the members. We established the current state of matchmaking research, designed the test (questions, algorithms, evaluation units), and validated the test regarding the personality instruments NEO-PIR and MBTI, and for the test previously used by be2. Subsequently, we advised be2 on the structure of a DATA Mining department and on the selection of personnel. Since several years for the Swiss IMWA Institut, we collect, analyze, and present data for extensive socio-demographic studies, which are needed for the new edition of an international bestseller. We select suitable methods for the respective questions (survival models, cluster procedures, support vector machines) and implement these for the analysis of extensive data records (comprehensive population surveys from the official statistics of Switzerland). We work in an international (Switzerland, USA) and interdisciplinary team (IT, physics, law) and are responsible for both, all statistical tasks as well as for quality assurance. In the context of a study on economic and social effects of the Hahnenkamm race Kitzbühel, we advised the project manager, Professor Dr. Uwe Eisermann, FH Kufstein/BiTS Iserlohn, on statistical method choice and the data evaluation of the Participants and Employee Survey 2006. In particular, we validated the questionnaire with a view on development of a standardised evaluation instrument for sport mass gathering events. Together with the Chair of Biomechanics in Sports at TU Munich (Olympic Training Center Bavaria) we analyzed measurement data from both, Nordic Combined and ski jumping, training and competitions for improvement of diagnostics and training plans in competitive sports. The results can also be found in several joint publications. The paper by Pyrka P, Veit M, Erlbeck F, Bösl P, Schwirtz A: “Performance Testing Through Isokinetic Strength and Jump Height Measurements in Nordic Combined” was presented at the World Congress of Performance Analysis of Sport VI, 2008, in Magdeburg. Supported by the public utilities company Stadtwerke München and the Chair for Water Chemistry at TU Munich, we developed a concept for sustainability accounting for water supply service providers. The study by Knöpfler S, Rau N, Schüller K, Wuitschik G and Carpenter S: „Liberalisation – the future of the German water supply?“ appeared 2002 in the publications series by the Bavarian EliteAcademy, and was presented to members of the Bundestag in Berlin, at the 2003 trade conference „Fachtagung Wasser“ in Lindau, and at the 2nd TTW seminar (Technologie-Transfer Wasser) in Munich. Market Studies, Social Media Analyses, Database Marketing, etc. Market research, market analysis, and marketing are classical fields of application for statistics. Ideally, we accompany our customers already in the planning stages of market research projects, i.e. sampling procedures and questionnaire methodology (scaling, formulation questions, pre-tests, reliabilities, and validity investigations). Frequently however we are only brought in after the data are gathered already. We then advise on the method choice or conduct the statistical evaluations, either based on existing raw data or on the tables from the first use by either the client or the previously assigned institute. As clients from the marketing industry you need reliable data, numbers, and facts, to make forecasts – sound predictions about markets, customers, competitors, and much more. This poses a challenge for forecast accuracy, likewise data from different sources, with different periods of validity, and varied base factors. Profit from our expert know-how in statistics, in particular data mining and multivariate statistics, to make the optimal decisions regarding customer acquisition and retention, customer loyalty and customer value. We bring in our experience in handling large data sets and missing data. Owing to outstanding knowledge in SPSS, R, Excel, and Powerpoint, our work integrates smoothly into existing systems, and we provide professional result visualizations. By applying geographic information systems (GIS) we present our findings also in the form of clear maps. As basis for a marketing budget plan we accomplished the detail evaluation of an international customer satisfaction survey in the commercial motor vehicle industry (NVBS 2005). We examined manifest and latent loyalty-relevant factors, formed commercial motor vehicle clusters, and conducted profile comparisons. Based on this, we identified and modelled the relevant competitors of the (former) parent company of the client. We conducted qualitative interviews for a DAX group in the context of competitor comparisons and evaluated the results as well as the data from quantitative parallel surveys. We provided recommendations for action on the individual target areas as decision basis for the development department. We advised the marketing department of an investment bank on the evaluation of data from a survey on the use of social media for business purposes. Only aggregated data (contingency tables) existed, from which conclusions had to be drawn about different user segments and the total relevance of Facebook & Co. for the asset management industry. For a wine importer we evaluated a study on demand potential of New World wines. We evaluated the market entrance opportunities for Argentine wines in Germany based on a grand wine tasting. The target audience and their preferences were analyzed, and the wines were classified according to most diverse criteria, so that a target group oriented marketing concept could be compiled. We developed 2008 the short test for a Facebook Widget for a marketing co-operation between be2 and Sony Pictures for the DVD release of ‘Made of Honor’. The test should have only seven questions, be compatible to the be2-Test, take up scenes from the movie, and facilitate rapid matching between main characters and friends. We designed the questions and analysis texts, created personality profiles of Tom (Patrick Dempsey) and Hannah (Michelle Monaghan), and developed the matching algorithm. Spatial and Capacity Planning for Schools, Transportation Planning, Housing Market Analyses, Government-funded Research, etc. As a client from the public sector, your planning is based on predicted economic and demographic developments. Apart from issues with forecast accuracy, data frequently come from different sources, with different periods of validity, and varied base factors. Nevertheless, your decisions need to be fact-based, transparent, and politically resilient decisions in the best interest of all involved parties. Owing to outstanding knowledge in SPSS, R, Excel, and Powerpoint, our work integrates smoothly into existing systems, and we provide professional result visualizations. By applying geographic information systems (GIS) we present our findings also in the form of clear maps. We advised the districts Erding, Miesbach, Bad Tölz Wolfratshausen, and Konstanz in the context of school development projects. We prognosticated the population and birth development, feeder patterns, school attendance ratios as well as the absolute numbers of students on community/individual school level with a planning horizon of 10-12 years. Were considered realistic demographic and economic conditions, e.g. development areas, economic development, and the drift behavior. Against the backdrop of possible political transformations of the educational system (district schools, G8, primary school for classes 1 to 6) we analyzed different scenarios and recommended strategies for the reorientation of branches of education, school specialism, for spatial planning and for the organization of local transport. We prepared in addition discussion papers as decision basis for the Bavarian State Ministry of Education and Cultural Affairs and provided track records. The district Miesbach made the report available on the Internet. For the Kreisverwaltungsreferat (regional administration office) of the City of Munich and the GEVAS Systementwicklung und Verkehrsinformatik GmbH we analyzed green phases at computer-controlled traffic lights. Our results optimized the traffic flow in the context of the MOBINET project, the planning of new traffic light crossings, and the validation of traffic policy decisions. On behalf of the TU München, and financed by the Bayerische Landesbodenkreditanstalt, we analyzed demand-relevant factors for newly built freehold flats. The „Münchner Diskussionsforum für Entwicklungsfragen e.V.“ published our findings on it´s homepage in May 2006. For the Institut für Forschung und Ausbildung in Kommunikationstherapie e.V., a non-profit specialized psychological facility of the archdiocese Munich and Freising, we evaluated two long-term studies on the effect of marriage and relationship counseling on the parent – child interaction. The projects in question were JUFA (Junge Familien in der Ehe-, Familien- und Lebensberatung) and KESS (Kooperativ, Ermutigend, Sozial, Situationsorientiert erziehen). For two Bavarian cities we evaluated a citizen survey about senior citizen friendliness and advised on statistical questions regarding a study on the development of a city mission statement and on a „service world championship “. Many authors of environmental reports need a prognosis on the effects changes in the ecosystem will have. Quite frequently in complex systems this no longer can be estimated through educated guesses, but requires calculations and the simulation of scenarios. Our post-doc environmental scientists describe mathematically aquatic and terrestrial ecosystems, and use them in different computer simulations for the assessment of the environmental impact. For the monitoring of large solar plants we developed algorithms, aligning the expected prognosis with constantly measured performance data. We can determine whether the solar panels are defect, soiled or if tilt and angle need adjustment. With our competence in aquatic modelling we know how to simulate hydrophysical processes, nutrient concentrations, oxygen consumption, growth of algae and submerged macrophyts, and zooplankton- or fish populations and determine which measures impair or improve the water quality in a catchment area or water body. Our environmental scientists have extensive experience with spatially explicit models. The models simulate different ecosystems, as e.g. forests or areas with different land use, in their geographical context. Simulations for soil processes, drainages, plant growth, and habitat diversity are included as necessary.